12 Reasons to Choose Goldberg & Rodler for Your Landscape Needs | Goldberg & Rodler, Inc.
A community beautification project in Centerport/Huntington, partnership with Bottle Bargains and Bottles & Cases.As we approach our 60th anniversary, we pause to reflect on the last 6 decades and look forward to continuing our long-standing relationships with clients and our award winning tradition. These twelve reasons illustrate the care, dedication, and professionalism our clients have recognized in our company. 1. 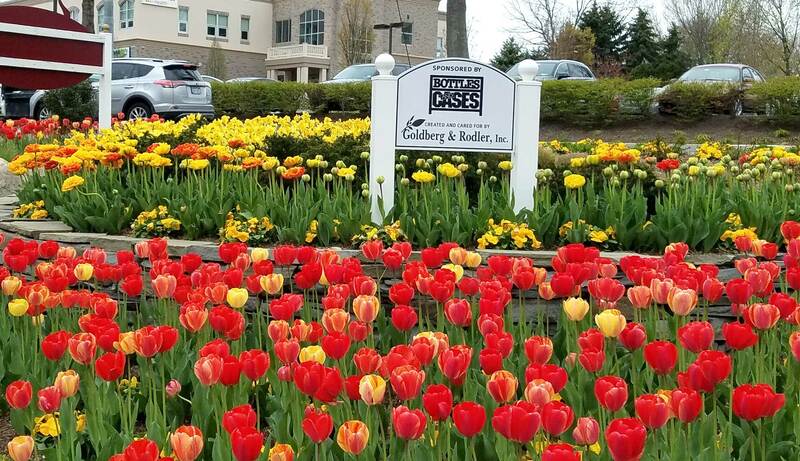 Our People: Goldberg and Rodler prides itself in having a highly talented and passionate group of certified and university trained professionals eager to see your project through from concept to completion. 2. History: We are a second generation landscape firm that began operations in 1958, so you can count on a stable company with a staff of loyal, dedicated, and experienced landscape professionals. 3. Integrity and Reliability: Goldberg and Rodler is a client focused organization with a fundamental belief of building trust by living up to our agreements and dealing honestly with our clients through dependability, accountability, and responsibility. 4. Environmentally Responsible: We recognize the need to protect and preserve our environment for immediate and future generations and we believe that understanding, respecting and following the laws of nature is paramount. 5. Knowledge and Innovation: As a team, we are always looking for new ways to fulfill your needs. We evolve with new technology to solve challenges, improving our products and services. Our goal is to support and create both a functional and beautiful outdoor living environment that will continue to give joy and comfort for many years to come. 6. Single Point Responsibility: Single point responsibility allows you the peace of mind that one person, either a landscape designer or project manager will always be available to discuss any questions, concerns, or needs you may have. As a team of professionals, we bring a variety of viewpoints and expertise to the design and implementation of your project. At Goldberg and Rodler we always strive to not only meet but exceed your expectations. 7. VIP Status: All of our clients, regardless of the size of the project, are given VIP status with personal attention 365 days a year. Whether you have a question, concern, need help after a storm, setting up for a party, or anything else, we are always available to mobilize our crews and provide the best possible solution to your specific need. 8. Reputation: Since inception, our landscape company has strived for over seven decades to develop and maintain an excellent reputation and has won the confidence of many high profile commercial clients including LI Jewish Medical Center, Gurwin Jewish Geriatric Center, SUNY Farmingdale University, Eisenhower Park – MADD Garden, Fay Lindner Assisted Living, Zucker-Hillside Hospital, Montauk Manor, The Shoppes at Greenvale, Catholic Health Services and many more. These relationships, and an extensive list of satisfied residential clients, have been nurtured through the quality oriented philosophy of our company, our logistic wherewithal and horticultural expertise. Client referrals are available upon request. 9. Horticultural Expertise: We bring a high degree of horticultural knowledge and many years of landscape experience to each and every project. Our staff includes certified arborists and nursery professionals, licensed pesticide applicators and trained horticultural experts. 10. Full Service Landscape: In addition to our landscape design and installation capacity, we offer a wide range of a la carte services including Seasonal Flower Plantings, Tree Care, Property Maintenance, and Winter Pruning to help nurture, maintain, and ensure the health and quality of your landscape for many years to come. 11. Dedicated Service Department: Our experienced and certified professionals will diagnose your horticultural problems, recommend a solution, and dispatch our service crew promptly. 12. Award Winning Projects for Over 50 Years: We bring this award winning history and experience to all projects large and small. In total, our landscape professionals have over 400 years of combined landscape and horticultural experience.